you can use the advanced techniques of sudoku more easily. We recommend you try the Sudoku game. The Samurai Sudoku puzzles is another variation of the original Sudoku Puzzles. It has a unique solution that can be reached logically without guessing. It's fun. It's challenging. It's addictive! 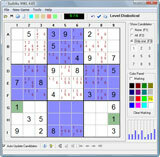 Print unlimited Standard sudoku puzzles to PDF file. Print unlimited Samurai sudoku puzzles to PDF file.